1. Johnny McCants hits a halfcourt buzzer beater to stun Grand Canyon. With the Aggies leading by three wth 35 seconds left and with possession of the ball, AJ Harris had his pocket picked not once but twice leading to two GCU layups and a one point deficit. 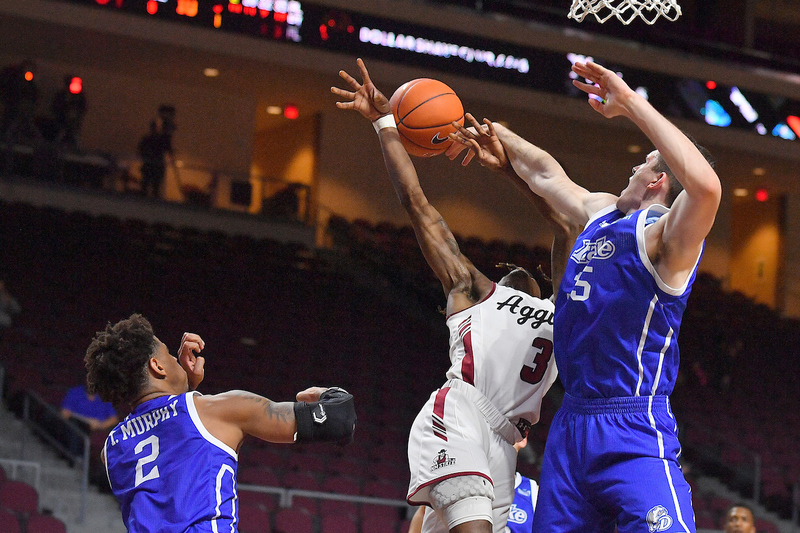 Terrell Brown would miss a pair of free throws that could have tied or given the Aggies the lead but GCU’s Trey Dreschel missed the front end of a one-and-one with six seconds left and the rest is history. 2. Trevelin Queen beats the buzzer to stun Cal State Bakersfield in overtime. This was perhaps an even more bizarre a final 69 seconds than the Auburn game. The Aggies were riding a seven game win streak after dropping their WAC opener at Cal Baptist. The streak looked dead in the water with Bakersfield leading by nine points with 1:09 left to play. After a Johnny McCants free throw cut the Roadrunners’ lead to eight with 58 seconds left, the Aggies started pressing and Bakersfield completely unraveled committing four turnovers meanwhile the Aggies would get a jumper from AJ Harris (deficit cut to six), a free throws from Terrell Brown (deficit at four), another pair of free throws from McCants (deficit at two) and a dunk from Brown (tie game). The Aggies then trailed by a bucket after a Jarkel Joiner jumper with eight seconds left but Trevelin Quieen would hit a wide open three at the buzzer for the win. 4. New Mexico State avoids historic collapse at The Pit. The Aggies led by 19 points with nine minutes left, by 14 with 2:25 left and by seven with 34 seconds left. A three pointer from UNM’s Vance Jackson with 23 seconds left cut the lead to three. missed free throws from Terrell Brown followed by a layup from UNM’s Anthony Mathis cut the lead to two points with seven seconds left. What followed on the ensuing inbounds play was a comedy of errors by both teams as Shunn Buchanan turned the ball over but then Anthony Mathis returned the favor as he was attempting to drive to the basket and the Aggies hung on and avoided what would have been a collapse of monumental proportions. The Aggies led by six with 50 seconds left but UTRGV hit a pair of threes, the teams traded free throws, UTRGV’s Tyson Smith got a layup with 13 seconds left to tied the game at 61 and then AJ Harris found Eli Chuha with a bullet pass for a layup with eight seconds left to give the Aggies the 63-61 win. JoJo Zamora buries Washington State with a three with 1.9 seconds left to give the Aggies a 75-72 win. New Mexico State led this game by as many as 16 in the first half. 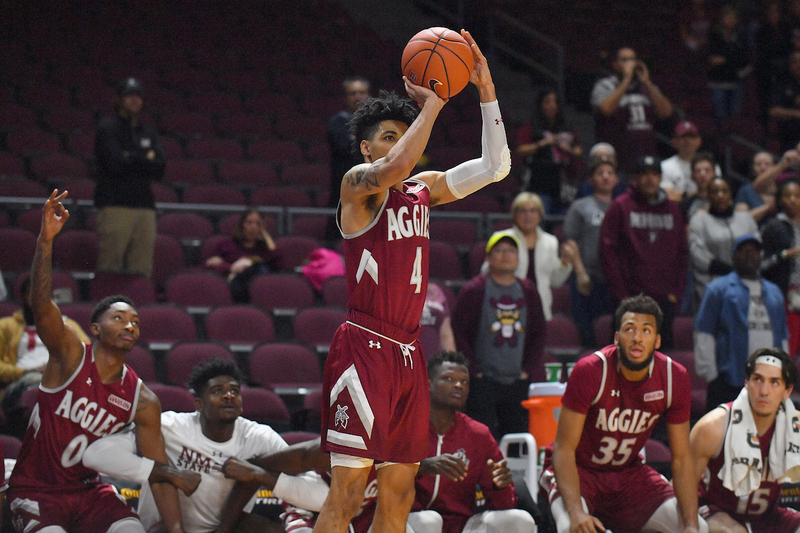 Trailing by 15 just a couple of minutes into the second half of their game against Drake, the Aggies chipped away and trailed by just one after a three pointer from Terrell Brown with 23 seconds left. After a missed free throw from Nick McGlynn, Terrell Brown drove the baseline and looked like he would get a go-ahead layup but was stuffed by McGlynn who would then hit a pair of free throws to ice the game. It’s time for this week’s deep dive into the numbers in this week’s matchup between the Idaho Vandals (3-3) and the Aggies (2-3). This is a pivotal game for both clubs as the two teams try to inch their way toward bowl eligibility. For Idaho, a win would put them within two wins of that magical six-win threshold with five games remaining. An Aggie win would put them halfway there with half the schedule remaining. It goes without saying but we’ll say it anyway, this is a matchup between two historically bad football programs. How bad? This is just the second time (the first since the very first matchup in 1971) that both teams come into the head-to-head meeting coming off a win in their previous game. The next 21 times these two teams have met, at least one of the two (usually both) have lost their previous game. A cursory look at Idaho’s statistics makes you wonder how they’re 3-3. They’re averaging just 20 points per game while allowing 37.8. They average just 3.96 yards per rushing attempt and have thrown for just 1,151 yards in six games (191.83 yards per game). They’ve turned the ball over 15 times while forcing just nine turnovers and their third down conversion rate is just over 31 percent. That begs the question, what is Idaho doing to win these games? All three of their wins have been by a field goal — 20-17 over Montana State, 33-30 at UNLV and 34-31 last week at UL Monroe on a last-second field goal. Their three losses have been blowouts but their three losses have also come against teams with a combined record of 13-3. So what can we expect from the Vandals? When they have the ball on first down, they’re nearly as likely to throw it as they are to run it. They’ve run 172 first down plays, 95 have been runs and 77 passes. Of those 172, just 21 have been “explosion” plays (runs of 10+ yards or more and passes of 15+ yards or more), the Aggies have been slightly better with 32 explosion plays on first down out of 178 plays. Those numbers break down to Idaho having a gain of 10+ yards one out of every eight plays they run while the Aggies have a gain of 10+ yards one out of every five plays they run. Defensively both teams are not good in terms of those same explosion plays with Idaho surrendering 10+ yard games 23 percent of the time while the Aggies are giving up 10+ yards on a play 24 percent of the time. When Idaho is faced with third down and short (1 to 3 yards for a first down) they, just like most teams, will try to run the ball. Idaho has faced 22 such instances and run the ball 16 times while throwing six times. They’ve converted 11 of the 22 third and short situations, nine first downs on the ground and two through the air. When Idaho is faced with a third and intermediate (4 to 6 yards to gain a first down) they are much ore likely to throw the ball. They’ve faced that situation 16 times and have thrown it 12 times, completing seven passes and converting six first downs through the air and one on the ground (6 of 16 on third and intermediate — a 37.5 percent conversion rate). When Idaho is faced with a third and long (7 or more yards to gain a first down) they surprisingly have run the ball nearly as many times as they’ve opted to throw it. They’ve had 50 third and longs and they’ve thrown it 29 times and run it 21 times. They’re just 10 of 29 passing converting five first downs while they converted four first downs on the ground (9 of 50 on third and long — an 18 percent conversion rate). If the Aggies can get Idaho into third and intermediate to long, they’ve got a really good shot at getting off the field. Defensively when the Aggies have the ball, teams have been just as likely to run the ball as pass the ball on first down against Idaho. Teams have rushed 106 times for 605 yards (5.71 yards per attempt) and thrown the ball 99 times completing 65 times for 820 yards. They’ve surrendered 46 first downs and as we eluded to earlier, teams are having pretty good success gaining large chunks of yardage against Idaho, particularly on first down. The Vandals have surrendered 49 explosion plays (again, 10+ yard gains) out of the 205 1st down plays they’ve defended — a 24 percent clip. Not good. When the Aggies are faced with third down they’ve been moderately successful with a 40.4 percent conversion rate. Idaho’s opponents are converting nearly 46 percent of their third downs (by way of gain and penalty). When Idaho’s opponents face a third and short (1 to 3 yards to gain) they’ve had success both on the ground and through the air converting eight first downs on the ground (out of 13 runs) and five times through the air on 6 of 9 passing — a conversion rate of 59 percent (13 of 22). When Idaho gets teams into a third and intermediate (4 to 6 yards to gain) they’re having a little bit more success stopping them, they’ve allowed 10 of 23 (43.4 percent) conversions. Teams have run the ball seven times getting three first downs and thrown it 16 times completing nine passes while converting seven first downs. Where Idaho’s defense has stood tall is on third and long (7 or more yards to gain). They’ve forced 40 third and longs with teams converting just 13 times (32.5 percent). Teams have run the ball 12 times on third and long gaining three first downs while passing it 28 times, completing 17 of those with 13 going for first downs. One other interesting stat to point out. Opposing teams have snapped 271 plays from their own 40 yard line or better compared to just 171 plays inside their own 40 (39 yard line to their own endzone). Teams are spending a LOT of time on the plus side of the field against Idaho. Offensively Idaho has not spent a ton of time on the plus side of the field. They’ve snapped the ball 180 times from inside their own 39 yard line and just 182 from their own 40 yard line to the opponent’s redzone. One thing Idaho does do fairly well is score given the opportunity. They’re 15-of-20 (75 percent) when they get to the redzone and they’ve converted 12-of-14 field goal attempts. The Aggies have not faired quite as well in the scoring department with scoring just 17-of-24 times they’ve been in the redzone (70.8 percent) and are just 6-of-9 in the field goal department. Bottom line here is that on paper the Aggies have the offense to put a lot of points on the board in this game. Whether or not they do so will depend a lot on what kind of day Larry Rose III has. In two games against Idaho he has run the ball 42 times for 367 yards (8.7 yards per carry) with six touchdowns. Granted, four of those touchdowns and over 200 of those yards came in last year’s wild come-from-behind victory but the fact of the matter is he is a one man wrecking crew almost regardless of who he is playing against and it would be wise for the Aggies to go to him early and often. Tyler Rogers did not play against the Vandals last season due to injury and in 2014 against Idaho had a game to forget. He came in late, threw five passes, two of them were picked off as the Aggies lost 29-17. For whatever reason the Aggies have really struggled against Idaho in Moscow. The last win there came in 2002 and the Aggies have gone into Moscow with teams that on paper should have beaten Idaho only to lose. On paper this feels like a game the Aggies should win fairly easily but as we just noted, that hasn’t been the outcome the Aggies have gotten particularly at Idaho. We’re back to take another statistical deep dive as we look at this week’s matchup between the Aggies and the Troy Trojans. Despite being 1-2 on the season, the Aggies have plenty of positives heading into this week’s game against the Trojans. First and foremost the Aggies will see the return of Sun Belt Preseason Player of the Year Larry Rose III who will be making his 2016 debut. Second, the Aggies played well offensively in last week’s game at Kentucky. The Aggies held their own offensively, especially in the first half scoring 35 of their 42 points before the break. Meanwhile the Trojans are 2-1 on the season with an impressive win over Southern Miss on the road last weekend, a Southern Miss team which rallied to beat Kentucky in Lexington in week one. The Trojans also hung tough with Clemson eventually losing 30-24. With those results in mind, what can we tell about Troy? Are they as good as their 2-1 record would indicate or are they overrated and getting a little too much credit for a “close” loss at Clemson? Troy ranks 39th overall on offense averaging 467 yards per game. They’re 24th overall rushing averaging 236.7 yards per game and 68th overall in passing averaging 230.3 yards per game which ranks just ahead of New Mexico State who is 69th in passing averaging 229.3 yards per game. The Aggies rank 85th in rushing at 154.7 yards per game. Defensively Troy ranks 59th overall giving up 363 yards per game. They’re 48th overall in rushing defense allowing 124.3 yards per game and 80th overall in pass defense giving up 238.7 yards per game. The Aggies are 63rd in pass defense giving up 218.3 yards per game but 127th in rush defense allowing 297 yards per game. Overall the Aggies are the 120th ranked defense allowing 515.3 yards per game. So as we did last week, let’s take a little deeper look at what those numbers represent. When Troy has the ball on first down, they’re slightly more likely to run than pass. They’ve run the ball 63 times for 433 yards while passing the ball 44 times (completing 30) for 322 yards. They’re averaging an excellent 7.05 yards per first down play which sets them up for a 2nd and short situations which really taxes the opposing defense. Where it gets interesting is on third down. Overall Troy is a horrendous third down team converting just 27 percent of their third downs. However, if you dig deeper into that number you’ll find that they’re actually a very respectable third down team when they’re faced with a short to intermediate third down (six yards or less to gain). They’ve converted 9 of 20 first downs in which they’ve had to gain six or fewer yards. Where they’re terrible is when the defense gets them into a third and long situation where they have to gain seven or more yards. In that scenario they’ve converted just TWO of their 24 third down situations. The key for the Aggie defense will be to force Troy in to third and long situation which will obviously be much easier if they can hold Troy under their first down gain average of just over seven yards. How does that stack up against the Aggie defense? Well, New Mexico State is giving up 6.39 yards per play on first down. Teams have predominantly run against the Aggies on first down with good success — 82 rushes for 471 yards, an average of 5.74 yards per rush. Passing, the Aggies have allowed just 12-of-23 completions for 200 yards, however, eight of the 12 completions have gone for first downs. When the Aggies get teams to third down they haven’t been that successful getting off the field. Teams have converted 20 of 45 third down attempts. Teams are have converted 13 of 22 third downs where they’ve had to gain six or fewer yards but just seven of the 25 third downs where they had to gain seven or more yards, though with one caveat, teams have converted five of the eight third downs where they had to gain between seven and nine yards. Defensively Troy is allowing opponents to gain an average of 5.18 yards on first down. Teams are 29-of-47 for 286 yards through the air on first down and have rushed 51 times for 222 yards. As you can see their three combined opponents have been pretty even in their run/pass play calling on first down and that should continue as the Aggies have had 98 first downs on offense and have thrown the ball 49 times and run the ball 49 times but more on that in a bit. Troy has done a good job getting off the field on third downs. Opponents are converting just 28 percent of their third downs (not accounting for first downs gained via penalty). They’ve been good in third in short to intermediate (six yards or fewer) allowing just 11 of 29 third down conversions. They’ve been even better in third and long (seven or more yards) allowing just four of 24 third down conversions. So what does that mean for the Aggies? Offensively on first down they’ve doing pretty well averaging 5.72 yards per play on first down. As we mentioned before it’s been dead even playcalling between passing and running on first down. The Aggies have thrown 49 ties, completing 26 for 370 yards with half of those completions going for first downs. They’ve run 49 times for 191 yards, just 3.89 yards per run. When the Aggies have been forced into a third down situation, they’ve done reasonably well converting 17 of 37 third downs. They’ve converted seven of 16 third downs where they had to gain six or fewer yards. They’ve also done relatively well on third and long (seven or more yards to gain) converting 10 of 21 times. They’ve been even better with between seven and nine yards to gain converting on seven of the 12 times they’ve faced that situation. So what is the final takeaway from this deep dive? The Troy offense is potent on first down and they’ve converted well on third and intermediate to short. If the Aggie defense can force Troy in to third and long situations it will obviously help tremendously. Offensively if the Aggies can get into third and short situations it goes without saying that they should be successful. Troy has been at their best when forcing teams in to third and 7+ yard situations. Obviously having Larry Rose III back will be a boost for the Aggie offense, though how effective he is remains to be seen and it would be unwise to expect Rose to be back to his pre-injury form right away. From what we’ve been able to gather, these injuries can take up to six months to fully heal and the last thing to come back is the side-to-side, lateral explosive movements which are something a running back like Larry Rose III depends on a lot in his game. As the Aggies head toward their game against Kentucky, what can we glean from the first two games that might point to what we can expect on Saturday in Lexington? At 1-1 the Aggies head into this matchup with some confidence coming off their 32-31 victory over in-state rival New Mexico while things at Kentucky aren’t so rosy right now. The Wildcats are 0-2 and since leading Southern Miss 35-10 with about 56 seconds left in the second quarter, they’ve been outscored 79-7 over the last six quarters giving up 79 straight points from the end of the second quarter against Southern Miss until just under five minutes left in the fourth quarter against Florida when the Kentucky offense finally got back on the board with a touchdown. A cursory look at the statistics show that the Wildcats are allowing 542 yards per game while the Aggies are giving up 427 yards per game. Offensively the Wildcats are averaging just 279 yards per game (95 rushing and 184 passing) while the Aggies are averaging slightly more at 326 yards per game (120.5 rushing and 205.5 passing). Let’s take a deeper look into those numbers and how they’re getting there. When Kentucky has the ball, what can the Aggie defense expect? For one, if form holds, the Wildcats will run the ball on first down. Of their 45 first down play calls this season, 31 of them have been runs and they’re averaging a solid 5.0 yards per carry on those first down runs. When they have passed on first down, they’ve been pretty efficient, certainly more efficient than on any other down completing 64.3 percent of their passes for 171 yards. Defensively teams have tried to run the ball against the Aggies on first down with relative success, 50 attempts for 4.94 yards per carry so based on Kentucky’s numbers that likely won’t change much. The Aggies have done a relatively good job on first down defending the pass as teams have completed just 6-of-15 attempts for 92 yards, though four of the six completions have gone for first downs. Kentucky has been abysmal on third down converting just 5-of-21 third downs. Unfortunately for the Aggies, they’ve allowed teams to convert on 14-of-27 third down attempts and perhaps more alarmingly, they’re allowing an average of 9.55 rushing yards on third down and even worse yet, teams are averaging over 20 yards per carry when faced with a third down of 10 or more. Opposing teams have also converted on 4-of-7 third downs through the air when faced with a 3rd down of 10 or more yards. That being said, last week against UNM one of the Aggies’ keys to winning the game was their defense getting off the field. The Lobos were just 3-of-10 on third down. So what can we expect out of the Kentucky offense in the game? Based on the first two games we would expect Kentucky to come out and try to run the ball against the Aggies in the first quarter, despite that going against what they have done in their first two games. The Aggies have given up 155 first quarter rushing yards with an average of 7.38 yards per carry. The Aggies have progressively gotten better defending the run as the game has gone on with averages of 4.07, 4.95 and 5.75 yards per carry in the subsequent quarters respectively. If you’re Kentucky, you probably want to get things going on the ground early before Frank Spaziani’s defense gets things figured out. Will Kentucky try to test the Aggie secondary as UNM tried to do in last week’s game (effectively going against what they’re primarily built to do and that is run the option attack)? The Aggie defense has been the most vulnerable to the pass game in the second and third quarters giving up 132 yards and 97 yards respectively with all three of UTEP and UNM’s passing touchdowns coming in those two quarters. For Kentucky, their passing game has flourished in the first quarter with them throwing for 221 yards on 10-of-15 passing with three touchdowns and just one interception. In the second, third and fourth quarters however, there has been a dramatic decline with the Cats going just 9-of-24 for 147 yards, one touchdown and three interceptions. What about the Aggie offense? Can NMSU take advantage of what has been so far a pretty leaky Wildcat defense? Through the first two games of the season it has become painfully obvious that the offense misses Larry Rose III and the impact he has on opposing defenses. The Aggies are averaging just 120.5 yards per game on the ground after averaging 180.5 last season. The Aggies clearly miss his 137.5 yards per game. They also miss his red zone running which is where he scored 10 of his 14 touchdowns last season. For lack of a better description the Aggie offense has been underwhelming in the first halves of their two games this season — just 277 total yards and only one touchdown. Kentucky’s two opponents have found marginal success through the air in the first half against the Wildcats. Their two opponents threw for 345 yards and three touchdowns against UK in the two first halves but they also threw four interceptions, something that Tyler Rogers has thus far been able to avoid. Their two opponents have found relatively equal success against Kentucky on the ground in both halves rushing for 238 yards and two touchdowns on 56 attempts in the first halves and 268 yards and three touchdowns on 62 attempts in the second halves. This could be good news for the Aggie ground game as they’ve been pretty consistent in both halves running the ball with 127 yards on 28 carries (but no touchdowns) in the first halves of their two games and 114 yards on 37 carries but three scores in the second halves of their two games. The passing game from a statistical perspective has come alive in the second half for NMSU having thrown for 261 yards and a touchdown on 23-of-40 passing from Rogers and have found the most success throwing the ball from their own 20 to the opponents 40 yard line accounting for 248 of the Aggies’ 411 total passing yards. Again, the Aggies miss Larry Rose III’s running in the red zone as Rogers has completed just 5-of-13 of his passes inside the red zone but both of his touchdown throws have come from that area of the field. Also, the Wildcats have been not that great on third down defense allowing their two opponents to convert 23-of-37 third downs (62 percent) including 7-of-9 third downs where the opponent had to gain between seven and nine yards for the first down and called a pass play. Good news for the Aggies? They’re 4-for-4 in that exact situation. So what do we expect the Aggies to do on offense? Well, Coach Martin has repeatedly said he wants to throw the ball to open up the run game (which we suspect would be reversed were Larry Rose III healthy and playing). The problem is that so far that hasn’t worked out too well for the Aggies. The Aggies have just 150 passing yards in four first half quarters and just 127 rushing yards in those same quarters. The Aggies have not been successful running the ball on first down averaging just 2.63 yards per carry but they’ve also been average throwing the ball on first down completing 17-of-33 attempts and just seven first downs. That means that 43 of the Aggies’ 60 first down plays have resulted in them facing a second down of over seven yards and 16 of those have been 2nd and 10 which has led the Aggies to face 17 third downs where they needed to gain seven or more yards for the first down. They have successfully converted just five of those third down situations. Regardless of Kentucky’s porous third and long defense, the Aggies simply can’t put themselves in third and long situations against Kentucky. As game day against Kentucky draws closer here are a bunch of stories to get you caught up on the matchup. Start here with the weekly press conference videos with head coach Doug Martin, senior running back Xavier Hall and linebacker Dalton Herrington. Jason Groves of the Las Cruces Sun-News takes an early look at the game against Kentucky. CatsPause.com has a look at the storylines to watch and the players to watch in the matchup. Brian Rickerd of the State Journal writes that Kentucky head coach Mark Stoops hasn't quit but wonders if the players have. Ben Roberts of the Herald-Leader takes a look at the Aggies' players. Joe Mussato of SEC Country takes a look at five key things to watch for on Saturday. Ken Sickenger of the Albuquerque Journal writes that the Aggies will have their depth tested against Kentucky on Saturday. Brian Stultz of Campus Insiders previews the game on Saturday. The New Mexico State football team makes their 2016 home debut tonight against in-state rival UNM in the Rio Grande Rivalry. The Aggies have lost four straight in the series and are looking to bounce back from last week's 38-22 season opening loss at UTEP. The Lobos opened the season with a 48-21 win over FCS foe South Dakota. The Lobos rolled up 615 total yards of offense including 428 rushing yards. The Aggie offense struggled in the first game scoring just 16 points. Obviously the absence of Larry Rose III hurt the offense's productivity and it appears that he will not play again this week as he continues to recover from his sports hernia surgery. The Aggie defense didn't fare much better giving up 518 yards of offense including 249 yards to UTEP's stud running back Aaron Jones. The defense looked much more fundamentally sound than it has at any point during the past three season in terms of being in the right places, however, it was their poor tackling that largely led to their undoing. So where does that leave us for tonight's game? Without Rose this game is tough to predict. If the Rose were suited up and 100 percent healthy, we would have no problem predicting an Aggie victory. So much of what the Aggies were able to do on offense last year was dependent on the fact that Rose's rushing ability was going to loosen up things in the secondary because teams would bring in extra defenders to try to stop the Aggie ground game. In this game last year Rose rushed for 260 yards and three touchdowns and likely would have had similar results this year -- UNM gave up 183 rushing yards to South Dakota last week, albeit on 43 attempts (NMSU rushed for 308 yards on 39 attempts against the Lobos last year). Head coach Doug Martin has stated that the Aggies will have plenty of one-on-one opportunities against the Lobos' secondary and seems to indicate that the Aggies will try to pass, a lot. How many pass attempts will that be? Without Rose in the backfield it could mean 35 or even 40-plus throws. In his career as the Aggie quarterback, NMSU is just 1-7 when Rogers attempts more than 40 passes and he has thrown 13 interceptions in those games (he did not throw in interception in last week's game in which he attempted 41 passes). Throwing the ball down the field could also lead to a lot of long third down situations if the Aggies don't complete passes on first and/or second down. Over his career at NMSU Rogers is just 49-of-92 on third down throws where the Aggies had 7 or more yards to gain for a first down and the Aggies have picked up just 25 first downs and 12 times he has thrown an interception. Suffice to say the Aggies need to keep their third down attempts manageable which means the Aggies will need to be able to run the ball effectively on first or second down or be able to complete some short passes on first and second down. Defensively it's pretty simple. The Aggies HAVE to tackle better than they did last week. The Aggies were in position on many of the Miners' big plays but missed tackles cost them. If they replicate their tackling effort this week it will be a long night for the Aggie defense. One other key will be to eliminate the untimely penalties. Last week the Aggies were flagged seven times for 40 yards. An interesting stat from last season, the Aggies actually committed more penalties at home than they did on the road despite only playing five home games. The Aggies committed 8.8 penalties for 81.8 yards per game. Obviously this is the Aggies' first home game of the season but it will be critical for the Aggies to not replicate the stat. If the Aggies hit those three keys they'll have a great chance to win tonight's game and snap the losing streak to the Lobos. If they miss on any of the keys, in particular the first or second, it seems unlikely that NMSU can pull out a victory. Tonight's game is scheduled for a 6:00 p.m. MDT kickoff and can be seen on AggieVision and Watch ESPN. In case you haven't checked out Jason Groves' post-game commentary from Saturday's season opening loss to UTEP you should. We agree with two of his three points -- Rogers being rusty and the Aggies showing mental toughness, in fact we made the same two points in our blog post yesterday. What we can't quite get behind is Jason's feeling that the defense has improved, especially after giving up 518 yards including a career-best 249 on the ground to Aaron Jones. Jason brings up the fact that the Aggies' defense is more aggressive a fact which is indisputable. He highlights that by the fact that the Aggies had 13 tackles for loss in the game after finishing last season with a grand total of 56 which was seventh fewest in the country last season. This is where the argument falls apart. We took at look at each of the 13 tackles for loss and then we looked at the play immediately following it and the results were stunning and, if you're a fan of defense, not pretty. The Aggies had four tackles for loss on one drive, UTEP's long drive that spanned the end of the first quarter and start of the second in which the Aggie defense, to their credit, made an impressive stand and forced a field goal after UTEP spent what felt like half an hour in the Aggies' red-zone. The first tackle for loss (an Aaron Jones run) netted a loss of one yard for UTEP. However, on the following play the Aggies gave up 15 yards on a personal foul penalty. The next tackle for loss (also an Aaron Jones rush) netted a loss of four yards but on the ensuing play the Aggies gave up an 18 yard gain to Aaron Jones on third and 13 no less. The third tackle for loss on the series came on first and goal from the 2-yard line netted a loss of one on an Aaron Jones run. The ensuing play the Aggies appeared to force an incomplete pass but wait, the Aggies were called for offsides, a gain of two yards (half the distance to the goal in this instance instead of the normal five yards). The fourth and final tackle for loss netted negative four yards, again on an Aaron Jones run. This time the Aggie defense stood up and forced an incomplete pass on third and goal from the 5-yard line forcing a Miner field goal attempt which they converted. The next two tackles for loss came on UTEP's next possession. The first tackle for loss was a big one netting negative nine yards on a run by Quadraiz Wadley, UTEP's true freshman running back on his first collegiate carry. On the very next play the Aggies picked up another tackle for loss, this time a net of negative three yards on a run by Juniel Terry. So far so good right? Well, on the next play (third time's the charm if you're UTEP), Quadraiz Wadley ripped off a run of 29 yards and two plays later the Miners were in the endzone for a touchdown. The next two tackles for loss came on UTEP's ridiculously long 17-play drive that basically killed the rest of the first half. The first tackle for loss netted negative four yards on a screen pass to Juniel Terry. On the very next play (third and 14) UTEP picked up 15 yards and first down. The second tackle for loss in the series came down on the Aggies' goal line, a net of negative one on a run by Aaron Jones on first and goal from the 2-yard line (an obvious rushing down), however as you can probably guess, the very next play the Miners connected on a pass for three yards resulting in a touchdown. The Aggie defense did not record a tackle for loss in the third quarter so on to the fourth quarter we go. This time the Aggies got the best of the Miners as this tackle for loss netted negative five yards on a Quadraiz Wadley run but more importantly the Aggies stripped the ball, scooped it up and ran 50 yards for a touchdown to pull to within 16 points at 38-22. The next UTEP drive the Aggies picked up a tackle for loss netting negative 11 yards on a sack on 1st and 20 (coming off a UTEP holding penalty). The Aggie defense forced an incomplete pass from Kavika Johnson and two plays later UTEP was punting. The final three tackles for loss came on the game's final drive. The first tackle for loss netted negative three yards on a run by Aaron Jones. The next play Jones ripped of a 12 yard run to set up 3rd and one on which they gave Jones the ball again and he ran for another 15 yards. The second tackle for loss in the series netted negative seven yards on a Quadraiz Wadley run. Wadley then ran for 13 yards on the next play setting up 3rd and 4. The final tackle for loss which may or may not be credited was the kneel down netting negative three yards. So final tally here, the Aggies had officially 13 tackles for loss for 56 yards which is certainly a positive however, if you look past the surface you'll see that they gave up 107 yards on plays that immediately followed the tackle for loss and eight of the 13 tackles for loss came on three drives that netted UTEP 17 points. Is the Aggie defense more aggressive? Clearly the numbers say they are but as you can see, being more aggressive on defense does not necessarily correlate to having a better defense. In this particular game the additional aggressiveness amounted to putting lipstick on a pig. The defense may have been aesthetically more pleasing but the results were the same. One hopes that the Aggies continue to be aggressive on defense but also follow up those aggressive plays with more solid defense on the ensuing plays. The Aggie football team opened 2016 with a loss at I-10 rival UTEP, the eighth straight loss in the series. A sluggish start offensively doomed the Aggies as UTEP built a 24-3 halftime lead. The Aggies cut UTEP's lead down to two touchdowns at 24-10 late in the third quarter, however, UTEP scored a touchdown on the ensuing drive to push the lead back to three touchdowns. The Aggies answered with a touchdown as the third quarter clock expired to trim the lead to 38-16 (and a missed extra point from Parker Davidson) but UTEP would score the back-breaking touchdown to start the fourth quarter, a 75-yard run from Aaron Jones, to put UTEP up 38-16. The Aggies added a defensive touchdown on fumble recovery scoop-and-score but in reality, it was too little too late. The Good: The Aggies continued to fight after getting down 24-3 at halftime. They made it interesting in the third quarter cutting the lead to two touchdowns but couldn't get the stops they needed to trim the deficit any further. The Aggie defense showed a few flashes of improvement including a goal line stand in the first quarter that held UTEP to a field goal. They also forced a fumble and returned it for a touchdown in the fourth quarter. Tyler Rogers started to get into a rhythm in the third and fourth quarter after looking understandably rusty in the first half. Rogers was playing his first game at live action speed since the UNM game last year. The Bad: The Aggie offense looked somewhat lost without Larry Rose III. NMSU had to settle for a field goal on a first quarter drive that, had Rose been playing, they almost certainly would have scored a touchdown on. The Aggies lost the special teams battle. The punting was improved but twice the Aggies got pinned on their own one yard line, though to the Aggies' credit they did drive 99 yards for a touchdown the second time they got pinned on their own goal line. Parker Davidson also missed another extra point and while it didn't really affect the outcome of the game (unless you took the over), his extra point misses last year cost the Aggies at least one game. One would have hoped that he'd have moved past this issue but it appears at least for the time being that his demons still haunt him. The Aggies were also plagued by penalties at inopportune times. The Ugly: Aaron Jones rushed for a career-high 249 yards and two scores, both long runs, both where the Aggie defense missed tackles. The 249 yards were also the third highest individual rushing total in their program's history. Luckily for the Aggies they are unlikely to see a back as good as Jones the rest of the way but the missed tackles throughout the game is a bit concerning but is a correctable problem. The Aggies will need to clean some things up before the Rio Grande Rivalry game against UNM. The Lobos had 618 yards of total offense (albeit against an FCS foe) and as a team rushed for 428 yards. The Aggie baseball team sits just one game behind Seattle for first place in the WAC. The Aggies have an excellent shot at winning the regular season title and are nearly guaranteed a top two seed and a first round bye. The only way the Aggies do not get a first round by and a top two seed is if they are swept by Northern Colorado this weekend and Utah Valley sweeps their series with Chicago State. The less likely of those two scenarios is the Aggies getting swept by Northern Colorado as UVU could very well sweep Chicago State. Northern Colorado has plenty to play for as they will qualify for the WAC Tournament with a single win in the series with the Aggies. The following are the potential tiebreakers as determined by the WAC office. · Northern Colorado is in tournament with at least one win. Pascal Siakam (New Mexico State) - Siakam measured in with an enormous 7'3 wingspan on a 6'8.25 barefoot frame, which is the same wingspan as Thon Maker who is 3.5 inches taller than him. Siakam is an early entrant who is still deciding whether to keep his name in the draft. He plays with a high motor, and while playing at New Mexico State has made it tougher to garner publicity, his huge 7'3 wingspan, and 8'11.5" standing reach along with being an active and athletic PF, deserves a lot of recognition. Productive 22-year-old sophomore Pascal Siakam stood out during Thursday's game thanks to his non-stop motor, rim running ability and excellent mobility. He's not the most offensively polished prospect in attendance, but Siakam competes on every play, a useful skill when coupled with his 7' 3” wingspan, fairly quick (although not overly explosive) leaping ability, and agility. He's the first one down the floor on nearly every possession, which resulted in a few transition buckets, including an And 1 finish that came after sprinting out to run Jarrod Uthoff off of the 3-point line and then recovering to block his jumper (one of three blocks on the game). Siakam also showed impressive footwork defending the perimeter and ball screens, something he wasn't always asked to do at New Mexico State as the Aggies played quite a bit of zone. Siakam, who has a decent feel for who he is as a player, knocked down a short corner jumper and two of his three free throw attempts, but he still room to polish his skill set. He missed a face-up 17 footer, and botched a couple of finishes around the rim versus length. Siakam isn't the most physically imposing player at 227 pounds, but his compete level, energy, rim running ability, length and agility make him an very solid second-round prospect if he decides to stay in the draft.